What are the best FREE Non-Profit travel deals? Wholesale Hotels Group - Your tool for getting the best non-profit travel deals! Non-profit organizations are usually engaged in a plethora of social, cultural and community activities and the need for finding the best non-profit travel deals have been in high demand. While not all non-profit organizations are charities or focus only on charitable causes, most would have an unwavering commitment to be of essential help to people far and wide. Even local non-profit organizations need to make travel arrangements for various purposes. Those with a statewide or nationwide presence and the few that span countries will have to deal with the various challenges of frequent travel. Airfares are not poised to get cheaper. Accommodation would also undergo steady appreciation. Effectively, the cost of travel will only increase and then stagnate from time to time. It is imperative for non-profit organizations to look for the cheapest airfares, hotel tariffs and car rentals among other essentials. Some companies offer non-profit travel deals. Such deals are usually limited to a modest discount. Whereas normal travelers or tourists get a standard discount on hotel tariffs, non-profit travel deals may assure the same or a bit more saving. It is unlikely for such companies to have phenomenal discounts for non-profit organizations, unless one makes frequent bookings in large volumes. There are some non-profits that have hundreds of people working around the country and many of them are frequent travelers due to the work they do. Such companies may have some special arrangements with certain airlines and hotels, there could be a deal similar to the corporate discounts available to corporations that have its executives flying and traveling all the time. Small non-profit entities do not get access to these deals. That’s about the change NOW! Small non-profit entities want access too! Wholesale Hotels Group has a distinct approach to non-profit travel deals. The company deals in wholesale and allows Non-Profit entities regardless of size and regardless of the volume in reservations to obtain the lowest possible wholesale hotel prices worldwide. Even small-sized non-profit companies get access to prices that are not available to anyone else. Aggregator websites, travel agents and other companies would get some discount but not to the scale that a hotel wholesaler would secure. Wholesale Hotels Group offers access to its platform for Non-Profit entities of all kinds (small or large) completely FREE! While individuals pay for the access to obtain those discounts; non-profits do not have to pay anything EVER. As a non-profit, you can save more than what anyone else can offer on accommodation in a hotel, motel or resort is concerned. Qualified Non-Profit entities can sign up by clicking on the picture below and can expect a speedy approval within 72 hours. No credit card needed! 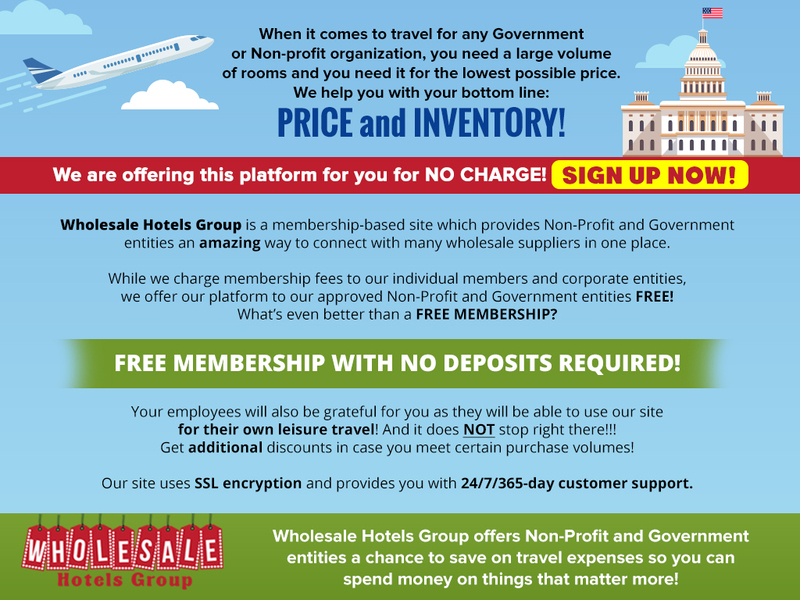 Wholesale Hotels Group – Your tool for getting the best non-profit travel deals!